In How we got the grant – Part I, I started telling you the story of how one organization overcame a long history of rejections to finally receive a grant from a very desired funder. The international child sponsorshop and development organization I worked for had tried and failed many times to receive a development education grant from the US Agency for International Development. We learned that one of the reasons for this was that our donor-to-sponsored child and family communications were not taken seriously by the funder and undercut our credibility. We initiated a process to explain the theory and practice behind our communications program to USAID. As a result of that, the door opened a crack. That’s where I left off. On to the next set of lessons. So, I now had the task of designing a development education program that would win funding and achieve our desired mission impact. Because our experience showed that people-to-people contact helped North Americans care about other parts of the world, we knew our development education program could take advantage of our 50 year history of direct communications. Our office was rich with the stories, photos, drawings and reports from sponsored children, their families, our international staff and town or village leaders.Our staff routinely oooed and awed over some dazzling art and images on 8 1/2 x 11 inch or A4 paper that serendipitously came through our doors en route to sponsors. What if we did something with art produced by children in our program countries? Let our kids tell their own stories, through their art and through their descriptions of the scenes they were sending. Oh yes, one more thing. Our development education program wouldn’t be built around an in your face story of poverty or helpless victims. We wanted to share the real stories of daily life, told by real children living those lives. One of the things that we had noticed about the development education projects that had been previously funded was that the majority were aimed at high school or middle school students. After a while, the projects sounded very similar. We had also learned that USAID staff weren’t interested in continuing to fund projects that seemed to be duplicates … after all, once a high school lesson plan had been created by one organization, couldn’t it be used by others? We took that to heart. 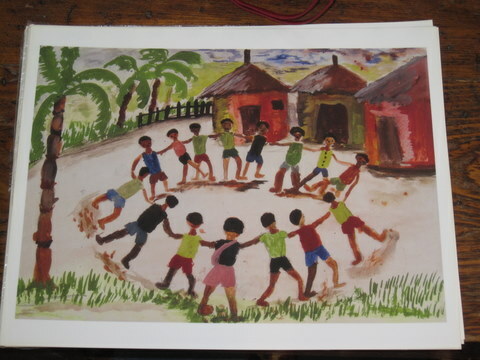 We had this great art and these first hand stories of individual children, their families and their communities. So how could we use the art to reach a new audience? And who would appreciate it the most. Duh! How about art teachers? Or elementary school kids? No one had developed a program for them yet. Because we didn’t have experts on staff who were elementary school educators, curriculum designers, artists or art teachers, we sought out expertise locally and nationally to help us think about the program design and the use of artwork. What we came up with, with their advice, was a development education program for 4 and 6th graders (because that’s where they were studying international issues in our potential pilot schools), multi-disciplinary to fit the elementary school model, and based on the art and stories of children in our program countries. We knew that we also had to build this expertise into our proposal design, so we included funding for a curriculum consultant who would also be the project manager and funding for an expert on art and teaching. We also added two advisory councils, one to select the art that included art teachers and an artist from Ghana who had recently relocated to our area, and a second teachers advisory group of those who would be interested in piloting the project and helping us test activities. And of course, a few individual with international development expertise. We found at least six or seven field directors from different parts of the world who loved the idea and were willing to work with us to get children in their area producing work about our themes: family, school, work, food, fun, home. We offered to cover the cost of any art materials and shipping that they needed as we knew this wasn’t in their budgets. They sent us what turned out to be very modest expenses which we included in the project budget. We weren’t able to convince our skeptical board members that this approach would work, but we were able to get them not to oppose our seeking out the grant. Whew. As we were pulling the project together, we needed to call it something. With some brainstorming by my staff and others in our office, my team finally decided on a name for the project that was both intriguing and captured its purpose. We decided to call it : See me, share my world. (Yes, there were many in the office who felt the name was too long. But we came to love it anyway). Because this was an art project, we knew we absolutely had to have some art in the proposal to help the reviewers understand what we were trying to do. So we found a wonderful drawing with a child’s explanation of what it was about and made that the cover of our proposal. We asked for $140,000 over two years, to be matched 100%, (largely through inkind). And we sent the proposal off. And waited. And waited. The project was a great success all around. Our field staff told us that the art projects energized their schools and unleashed creativity they hadn’t seen. Teachers loved the project. Our local art museum featured the work from one of the countries in a small exhibit. Then I left to take a position at another organization. Not too long after our second project completed, USAID approached the organization directly and asked it to design a development education/research project that tested the impact of targeted education materials on its sponsors. The ultimate grant fantasy — have a funder approach you about a project. You can find a short article on that research published in 1998 by The International Journal of Sociology and Social Policy.